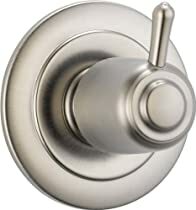 T11800-SS Finish: Stainless Steel Features: -For use with R1100" diverter rough-in. -Includes valve cartridge. Product Type: -Faucet trim only. Style: -Contemporary. Diverter Type: -Trim with diverter. Faucet Control Type: -Diverter. Faucet Handle Included: -Yes. Installation Type: -Wall mounted. Commercial Use: -Yes. Country of Manufacture: -United States. Number of Faucet Handles: -1. Dimensions: Overall Product Weight: -2.26 lbs. Looks great. Don't forget to buy the rough in valve body as this is only the trim and handle. The outputs for this are line 1, line 1+2, and line 2. 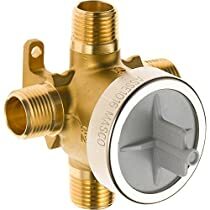 The other connection point is the supply from the shower valve. Has a good solid feel to it and works perfectly.